With health insurance and out-of-pocket costs on the rise, demand for voluntary insurance benefits is up. 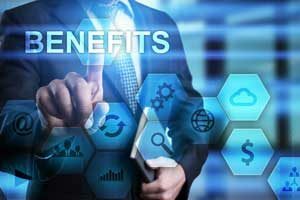 In fact, 81 percent of employees see a need for voluntary benefits, and 90 percent at least somewhat consider voluntary insurance part of a comprehensive benefits program.1 More employers are also starting to recognize this demand and the critical role voluntary benefits play in mitigating unexpected expenses. As companies reevaluate their offerings, voluntary benefits may be viewed as a “must have” that complements their core offerings, creating a strong benefits program. Keeping up with benefits needs is critical today. While employees were hesitant to move jobs during the recession, today’s healthier economy, booming stock market and low unemployment rate may be encouraging more to seek new opportunities – fueling competition among businesses for top talent. To attract the best and brightest employees, companies must work to become “employers of choice.” One important way to do that is by ensuring benefits offerings are robust, affordable and competitive. This will help companies woo talent, and research shows it will also help improve employee job satisfaction, productivity and retention.1 Moreover, voluntary benefits can be offered at little to no cost to a company’s bottom line, making them an invaluable addition to any benefits program. When working with clients to design a benefits package, brokers should keep the following benefits trends in mind. Need for greater customization. A one-size-fits-all benefits package no longer makes the cut, and it is even becoming taboo for business owners to limit the design of their employee benefits packages. This is especially true as employers look to balance the preferences and needs of more than three generations in their workforce. After all, a married worker with two children will need different benefits than a young professional just starting his or her career and living alone. Brokers can help clients select from a wide range of insurance options that will appeal to employees of all ages and life stages. In that same vein, demand for more flexible product designs is also trending. Companies want their employees to be able to pick and choose benefits and coverage levels that pair with their major medical, such as initial accident treatment, hospitalization and after care. While sales of traditional voluntary products, such as critical illness, are on the rise, the market is increasingly looking for plans that closely align with changes in medical treatments and technology. For example, my company’s latest cancer product was updated to align with the newest trends in medicine, providing benefits for genetic testing, immunotherapy and prophylactic surgeries. As health care costs rise, the market is also continuing to see growing demand for products that complement major medical. Some group insurance products combine accident, hospital indemnity and critical illness benefits into one simple plan design. This flexible product design allows employers to bulk up their offerings and creatively manage health care costs, while also helping employees manage out-of-pocket expenses. With these products, certificate holders receive cash benefits, when they are sick or injured, reducing financial stress. While companies recognize that 401(k) matching, flexible spending accounts and annual bonuses are great benefits, employees want companies to go the extra mile. These increased expectations are creating a demand for value-added services, such as health advocacy, student loan and tuition assistance, financial and legal assistance and identity protection. An online benefits builder platform makes it easy for companies to view and decide which services they want to offer and also the estimated costs, if any. These help give employers control and say-so over their final beneﬁts packages, as well as Day One value. The day-to-day management of benefits has become increasingly complex. When it comes time to select employee benefits options, many HR professionals are tired of selecting life insurance from one company, dental insurance from another and vision insurance from somewhere else. Moving to a one-stop-shop system for benefits enrollment and its related administrative tasks lowers stress and saves time by cutting down on a company’s reporting and paperwork. In response, more insurance providers are offering a wider range of products and services. What is more, forward-thinking companies realize that today’s workforce, consisting of many who grew up with the internet and smartphones, are influenced by digital messaging. As a result, employers are sharing benefits information and tips through various communication methods, such as emails, videos and traditional print materials. Sharing bite-sized pieces of information throughout the year instead of just annually will help make benefits information easier to absorb and open enrollment less overwhelming. While employees are becoming increasingly benefits-minded, many still struggle to fully make sense of their offerings. Only about one-quarter of employees are confident in their benefit choices, and nearly one-third (31 percent) said they need more information before their next enrollment to be confident in their selections.1 This shows how valuable expert guidance is to employers and their workforce. Clients and prospects rely on brokers’ knowledge and guidance to put together a selection of outstanding options that will place their company atop the list of most-desired employers. By ensuring benefits offerings are plentiful, competitive, affordable, and innovative, companies will be better positioned to attract and retain top talent. 1 2017 Aflac WorkForces Report. Accessed March 14, 2018. https://www.aflac.com/business/resources/aflac-workforces-report/default.aspx. The value-added services that are mentioned here are offered by multiple providers. Aflac’s affiliation with the value-added service providers is limited only to a marketing alliance. Other than this marketing alliance, Aflac and the value-added service providers are not affiliated in any way. Aflac makes no representations or warranties regarding the value-added service providers, and is not responsible for any of the products or services provided by the value-added service providers. The value-added services may not be available in all states, and benefits may vary by state. Each value-added service provider offers its products and services subject to its own terms, limitations and exclusions. Refer to plan details for further information on terms, limitations and exclusions. Aflac’s family of insurers includes American Family Life Assurance Company of Columbus and/or American Family Life Assurance Company of New York and/or Continental American Insurance Company and/or Continental American Life Insurance Company. WWHQ | 1932 Wynnton Road | Columbus, GA 31999.